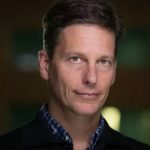 Longer smartphone holding periods, falling upgrade percentages, and an improving refurb/repair ecosystem are responsible for the sell-through decline. US remains an Apple bright spot as iPhone revenues increased 5%. 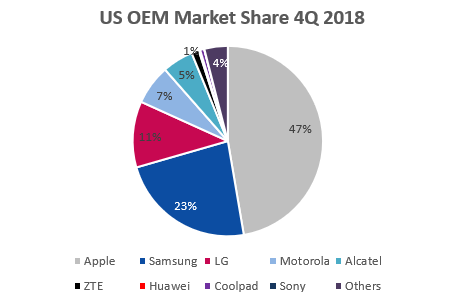 According to the latest research from Counterpoint’s Market Pulse program, the US market sold-through 10% fewer smartphones in the fourth quarter of 2018 than the same quarter in 2017. This is the first time we have seen a smartphone YoY decline in Q4. Fieldhack added, “Prepaid did not consume the number of handsets in 2018 it consumed across 2017. Prepaid used to have a holding period well under one year. Today, holding periods are closer to postpaid holding periods due to the higher quality of devices. Devices with large displays and batteries, with lower-cost mid-tier processors, are the workhorses within prepaid. These devices have the longevity of higher ASP postpaid devices. In addition, the evolution of the refurbish and repair ecosystem makes it easier for consumers to either purchase a high-quality used device or repair a current device. We estimate the US absorbed almost 11.5m refurbished smartphones in 2018. These are meaningful numbers of consumers deciding not to buy new.” For more see, Refurbished Handset Report. 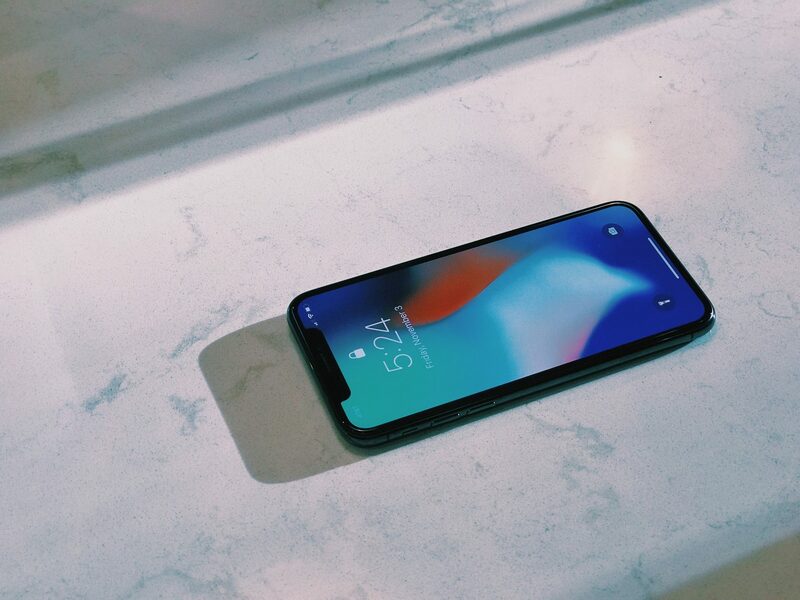 Apple: Early adopters hit the stores in September and October to purchase the XS Max and XS. In November and December, the largest volumes moved to the XR. 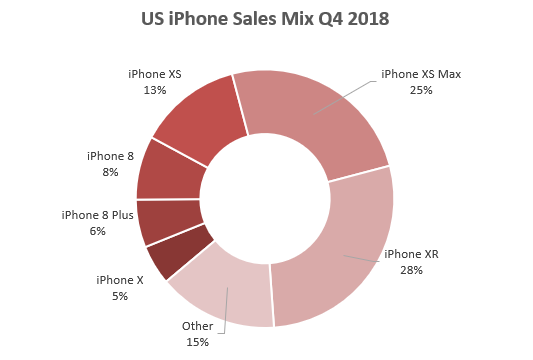 During Q4, top sellers were XR, XS Max, and XS. Verizon was the largest channel for Apple in 4Q18. Early signs that high-end sell-through will decline more than normal seasonality in the March quarter. 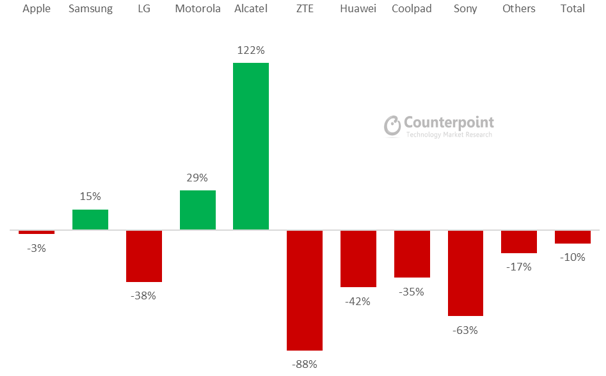 The only gainers during 4Q18 were Alcatel, Motorola, and Samsung. Alcatel and Motorola grew from small bases. Samsung was able to gain on the longevity of the Galaxy S9 and S9 Plus and a particularly strong November for the Note 9. J7 and J3 variants are strong within many prepaid channels.